Action: Pay 1 and exhaust The Three Bells to have each player choose and sacrifice a character. Then, place a success token on The Three Bells. 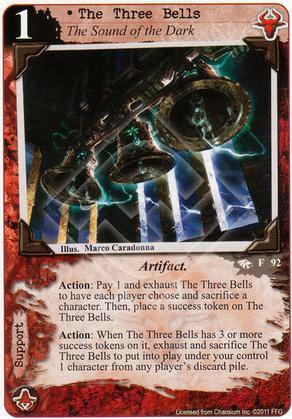 Action: When The Three Bells has 3 or more success tokens on it, exhaust and sacrifice The Three Bells to put into play under your control 1 character from any player's discard pile. But here its more like Opening the Limbo Gate (Core) so i think all need someone to sacrifice. Obtuse's Rebirth of the Cult makes good use of the Three Bells with a bevvy of cheap cultists to play off Gustaf Johansen, especially Initiate of Dagon, who recycles so nicely with Foul Induction. A "School Bells" deck could use 0-cost Miskatonic weenies to power the Sound of the Dark, and Untimely Burial to make sure you have some desirable powerhouse to awaken. What I like most about this is how for the second ability, it works on either player's discard pile, so if your opponent has discarded a useful character for any reason then you can hit them back with it. Does the Bells-player have to be able to sacrifice a character in order to trigger the first action? It's not part of the cost (since it follows the "to"-clause) and doesn't follows a "then"-clause, which would necessitate a full resolution of the preceding effect. All I'm pretty sure about is the fact that you wouldn't put a success token on the Bells *IF* you're able to trigger the Bells without having a character of your own to be sacrificed (since it depends on the full resolution of the preceding sentence). The controller of the Three Bells has to sacrifice a character, too. It's noted on the last page of the FAQ. I specifically remember searching (ctrl+f) the FAQ for this - guess I haven't done so with the newest iteration. Thanks! It's a solid card. It's a bit slow for my taste, since you really only get to reap its benefits after three turns, but it's low-cost and Shub usually has an easier time getting more characters into play than other factions. Indeed you can. If it couldn't, it would state a restriction of "Can only be triggered if it has less then 3 success tokens" or the like. Can I trigger The Three Bells (Revelations, F92) if I have no characters to sacrifice? No, in order to trigger an ability without the “if able” clause, you must be able to successfully resolve the triggered effect, and it is a singular effect that makes each player sacrifice a character, so if each player does not have a character to sacrifice the effect cannot be triggered.